copenhagen, the danish capital which can be reached for as little as £11 return from london luton. known for its delicious (but severely overpriced pastries), the famous little mermaid statue and nyhavn, the picturesque 17th century waterfront. but, christiana is copenhagen’s hidden gem. sitting across 84 acres on an abandoned military base, christiana was founded by squatters and artists as part of a “social experiment” in 1971. spirited and vibrant with a gritty edge, christiana is a ‘freetown’: flying its own flag with pride, the community cannot be touched by danish police. cannabis shops operate 24 hours a day (despite technically still being illegal to purchase from), street murals are found on every corner and art galleries, coffee shops and stalls all contribute to the organic vibes of christiana’s residents. living on canal boats, in houses made of glass windows and some even in post-apocalyptic looking buildings, the danish government sold christiana to its people in 2012 in a bid to avoid drug-related crime struggles and clashes with police patrol. strong beliefs in shared community ideals and traditional hippy values are rooted from the squatters whom originally created the autonomous neighborhood, christiana now homes 900 individuals – including families with children and elderly residents. whilst eye-catching, bizarre and alternative, use of photography is prohibited throughout the green light district and around communal areas to keep the wacky and weird wonderland secluded and dealers protected. 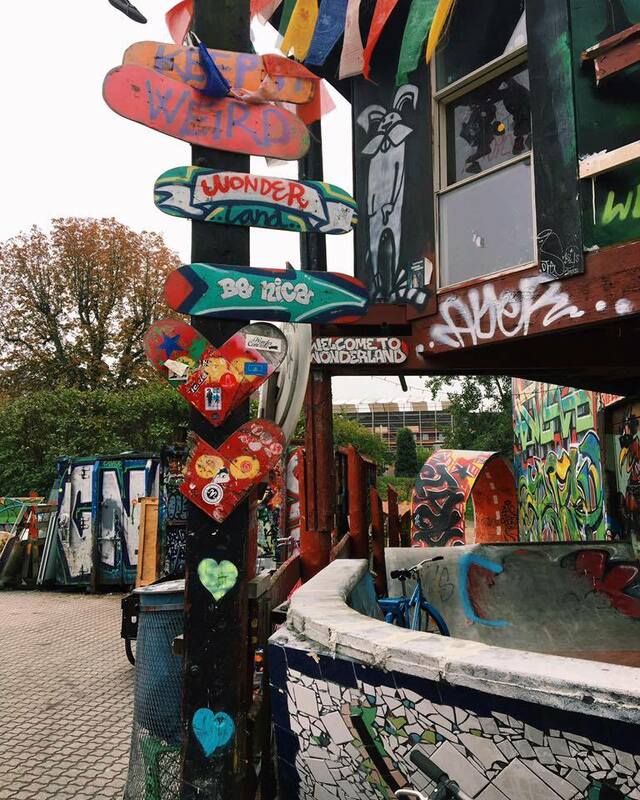 christiana offers fresh juices, a skate park, lovingly homemade cakes, crafted jewellery and live music venues to entertain visitors and locals alike; there’s even the opportunity to purchase merchandise including t-shirts, smoking pipes and bags at relatively low prices. as a bohemian neighbourhood, there’s plenty to eat or drink to make the most of the surroundings and experience. from brunch to lunch, hamburgers, vegetarian restaurants, bakeries and pizzerias, there’s variety to tingle your taste buds. café nemoland is famous for its sandwiches, coffee and dessert, and the appetites of vegans can be pleased by the dishes at morgenstedet and gronsagen too. despite not being featured on your typical tourist itinerary, freetown christiana is located in the christianshavn area – easily accessible by metro, bus or bike from the city centre. christiana does not welcome cars; so, take a stroll through, admire the art, taste the culture and obey the way of life. after exploring the entirely different world, there’s a large lake surrounded by colourful homes of all shapes and sizes only a short stroll away from christiana, carrying the chilled vibes still. freetown christiana encourages expression, creativity and liberation in a community of like-minded individuals. being intrigued and open with your thoughts, christiana and its locals offer incredible stories. they radiate an atmosphere which transports you to a place which encourages a ‘stay weird’ attitudes. christiana is residential, and not commercial – it’s one for the bucket-list but a place which works with a mutual respect and admiration to maintain its livelihood.